Scream spent a week in Gisborne on our way south. While in Gisborne we visited the museum, a brewery, and the cidery. Gisborne’s business district starts right at the marina. 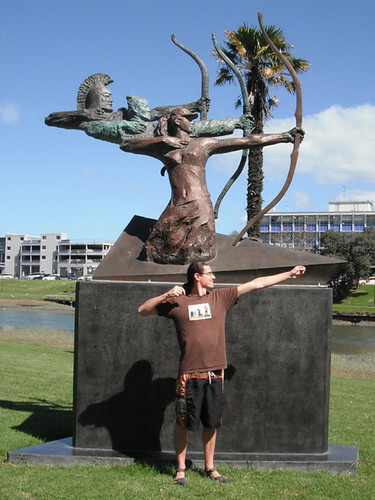 Gisborne is a large town and the regional centre, and as such has a fairly large commercial district. We enjoyed shopping and several good meals. Gisborne has a small harbour almost completely occupied by a small marina. There are four docks and room for sixty boats, mostly small recreational fishing boats. We were charged just over $2/m/night for our berth. The docks have some slight surge, but noticeably less than at most New Zealand harbours. The Gisborne Tatapouri Sports Fishing Club is located at the head of the docks. They are in the habit of giving temporary memberships to visiting boats, though this is supposedly not guaranteed. Without a membership they have good food and inexpensive beer. With the membership you can also use the showers located in the restaurant’s main bathrooms. Gisborne is quite isolated, so you’re not going to be stopping in unless you need to. Still, we had a good time and find Gisborne easy to recommend. Enjoyed your neptune’s finger here in cabo san lucas and makes us feel good to know you have cruised these waters. not too many sail boats nicer or bigger than yours here, Yes, a few cats and tris for the tourist trade, Yes, crazy expensive American motor yachts, and the sail boats tours are all with motors and no sails it seems. intriguing british type of flag here on yachts, Belize??? OK, I bite, what is the statue all about? Finally caught up with your blog and the bedbug info was really scary, but the charm and your cruising savvy came through. Also found your blog re electricity use very accurate given our experiences. Put in a high output alternator and this year also snagged a 2000 watt honda to combat those times up coast when it is continually cloudy, which do occur as you will probably remember. Great to hear you are doing well and look forward to seeing you.